Sales of 30,000 annually for first full hybrid made in Europe? Auris HSD (Hybrid Synergy Drive) will be sold, eventually, in 32 countries. The Toyota Plant in Burnaston, Derbyshire, is now making the new Auris hybrid, the first full-hybrid vehicle to be built in Europe, although some citizens of the UK might reject the “European” characterization. Sales of 30,000 are targeted for the first year, with customer deliveries starting this July. Eventually, Auris HSD (Hybrid Synergy Drive) will be sold in 32 countries. 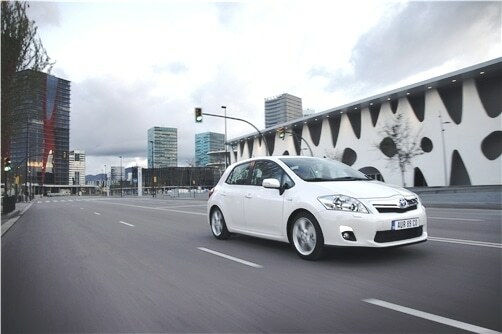 The design of Auris HSD has evolved from the Prius, the world’s first mass-produced hybrid vehicle. Prius was launched in Japan in 1997 and in Europe and North America in 2000. Prius is now in its third generation. Auris is very close in size and performance to the Prius, creating a potential marketing problem. I assume Toyota will offer the Auris for fewer Euros, and keep the Prius the premium nameplate. Auris is similar in size and performance to the Prius, creating a potential marketing problem. Prius, of course, much to the astonishment of the European and American automotive establishments was a major technological breakthrough – providing huge fuel economy benefits, as well as a “Green” marketing triumph for Toyota. Toyota plans to introduce full hybrid drive technology across the company’s entire model range by the early 2020s. “It is a proud day for Toyota Motor Manufacturing UK as we celebrate the official start of production of the Auris with Hybrid Synergy Drive, yet another premium quality model to be Built in Britain,” said Katsunori Kojima, Managing Director of TMUK. The new Auris HSD comes as 5-door hatchback, in the compact of C-segment – the heart of the Euro market. Auris has the hybrid category to itself, belying the common engineering slur from competitors that the company doesn’t innovate, just copies. It will be interesting to see who the fast followers are on this one. With class leading fuel economy, the Auris with HSD returns fuel consumption figures of only 3.8l/100km and remarkably low and CO2 emissions of just 89g/km, which for buyers is highly, well, tax efficient given European fees. In addition, the Auris with HSD generates significantly lower NOx and PM emissions than diesel engine cars of comparable performance; say the ones the Germans are so proud of. As I wrote the new Auris HSD will be assembled at Toyota Manufacturing UK’s Burnaston Plant, in Derbyshire, while its 1.8-liter gasoline engine will be built in Deeside, North Wales. Opened in 1992, Burnaston was Toyota’s first European plant. Auris HSD will be built on the same production line as the gasoline and diesel Auris, and alongside Avensis. TMUK represents a total investment of over £1.85 billion (€2.2 billion) and is one of nine Toyota manufacturing companies in Greater Europe. TMUK vehicle production passed the three million mark in June 2010.